So what is a Sail Shade? 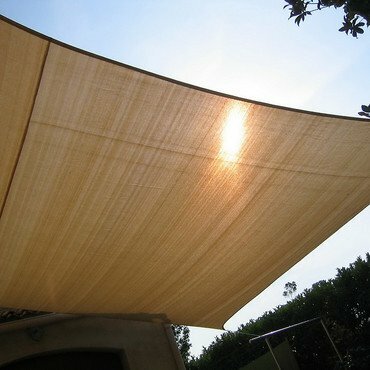 Sails Shades provide an elegant and 'original' solution. The use of sail cloth as protection from the sun first appear in historical documents from Roman times when sails were used specifically to create shade in order to protect people at communal venues such as the 'Colosseum'. Beached sailors discovered early on how their sails could be used to create shelter from the sun, often saving their lives. More recently a trend started in Australia around 20 years ago to stretch UV resistant fabric between posts to create a shaded area. Today, with advances in technology, Sail Shades are becoming more common in Australia than kangaroos! Normally fixed to part of the house, Sail Shades are used to protect pools, spas, barbecues, garages, patios and play areas for children. They are also used extensively in public spaces such as malls, parking lots, community spaces, crèches, schools, playgrounds and sports areas. These sails can also be used across large openings to reduce indoor temperatures as they block the sun but allow a breeze to enter. Approved by specialists in cancer research, 'Sail Shade World' Sail Shades offer proven, affordable protection against harmful UV rays from the sun. Sail Shades are designed to protect from the sun. To help create as comfortable an environment as possible in hot weather, they have been designed to allow air to pass through them so people beneath can benefit from any breeze. As air can pass they are not completely waterproof although the vast majority of the rain will flow off of the sides.